Genoa draw 1-1 against Parma. Ex-Genoano Alessandro Lucarelli opened the score in the 27th minute, just after Immobile missed 2 great chances. In the 67th minute a handball of Parma gave Borriello the great opportunity to score the equalizer but the post stopped his penalty. In the 88th minute Borriello was fouled in the penaltyarea and he took the penalty himself: 1-1. 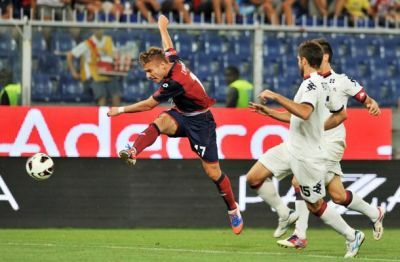 Genoa is now 9th in the standings with 7 points in 5 matches. Next Sunday we play at 12.30 hours in Stadio Friuli against Udinese. 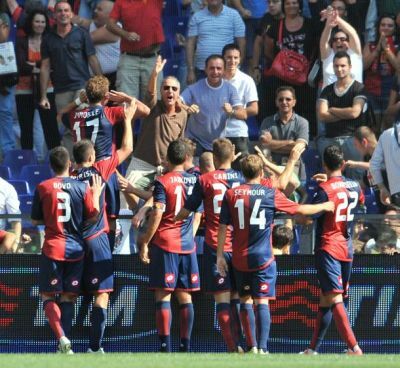 Last week we saw Bologna win in the Olympic Stadium of Rome against A.S. Roma with 2 goals of Alberto Gilardino. 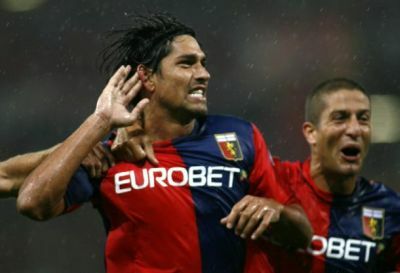 Yesterday it was the day of his substitute Marco Borriello to beat the best qualified team of Rome: Lazio. In the 79th minute Sebastien Frey shot the ball towards Kucka who headed it to Antonelli. Our left midfielder passed the ball in one time with the back of his shoe in the open space in front of Marco Borriello who ran faster then Ciani towards the goal and beat goalkeeper Marchetti in the far corner: 0-1. Wednesdayevening t 20.45 hours Genoa plays at home against Parma. Good match Genoa, Juve wins in last 15 mins. Marco Borriello in the 57th minute (header on the crossbar) and Andrea Bertolacci in the 61st minute (saved by Buffon who was already on the ground) were close to the deciding 2-0 in the match against the unbeaten champions of last season. Both players missed, just as Immobile in the 10th minute of the first half but he revanched himself 8 minutes later by scoring 1-0. After the openinggoal both teams were several times close to score and in the 43rd minute the match seemed over to Leonardo Bonuccio who stopped Kucka irregulary after he already had received a yellow card in the 25th minute for making hands in the wall to stop a free-kick of Jankovic. During halftime there was the news that the handball in the wall was made by Pirlo, but he already got a yellow card for protesting against the free-kick. In any case one of these 2 Juventus-players has got 2 yellow cards in the first half, but referee Rocchi saved the black and white like in the old days of Moggi to forget one of the cards at the free-kick. A big shame, but the halftime score: Genoa-Juventus 1-0! In the 2nd half Juventus started very agressive and did hit the post in the 7th minut before Borriello and Bertolacci missed the mentioned big chances of 2-0. Only 15 seconds (!) after the missed goal of Bertolacci Giaccherini scored in front of Gradinata Sud the equalizer: 1-1. Both teams tried to win the match, but it was a foul of Sampirisi (or great acting of Asamoah) who gave Juventus a penlty that was scored by Vucinic. The same Asamoah scored also the last goal 6 minutes before the end: 1-3, but after the last whistle of Rocchi the fans clapped their hands to the passioned red and blue players. With al little more justice and luck we could beat Juventus. Tomorrow Luigi Ferraris will be filled with at least 25.000 fans. Genoa plays against the champions of last season: Juventus that did not loose a match for over a year. We all hope this period will end tomorrow and think about last year when we unfortunately draw both matches against “The old lady”. Especially in Juventus stadium Genoa deserved a victory, but tomorrow we have a new chance. Mr. De Canio selected 22 players for the match, because only Rossi and Vargas (both injured) are not able to play. Marco Borriello returns for the first time after 4 years in the magic Rossoblu with nr. 22 in Luigi Ferraris against his team of last year. Daiiii Marco!